There’s a particular pleasure to watching Temporada de Patos that’s hard to define. As I was thinking about it this morning, it came to me…it’s like making a friend, or maybe even falling in love. Which is fitting because friendship and love and the blurry lines between the two are at the core of the film. From the opening credits you like the look of it–aesthetically it’s just your type. Simple, spare, a little bit rundown, but beautifully so. You watch it for a while, and it seems funny and smart, a little bit off-kilter, but in a way you like. And then you hang out with it, and have conversations, and everything it says is charming but sincere. Not “hey, baby, I’m so sincerious,” sincere, but honest and uncalculated and heartfelt. You get a peep at its music collection and it’s all kind of weird but good. Unexpected, but you feel it’s the absolute perfect thing at the perfect time. You keep waiting for it to let you down and say something off-putting, or start telling a story that’s overly dramatic or just doesn’t make sense, but that never happens. It all just clicks, softly and almost imperceptibly. And then you don’t want your time with it to end, you want to spend more time with it, and you think about it after it’s gone, and realize that it’s much more complicated than you realize. That’s what it was like with Temporada de Patos, the first feature from Mexican director Fernando Eimbcke. It’s one of those rare movies where everything seems to come together perfectly, every aspect is thoughtfully combined and there are no missteps. The plot is very simple. Two fourteen-year-old boys, Moko and Flama, have been friends since childhood. They plan to spend a Sunday together at Flama’s apartment when his mom is away. They have all their supplies, soda, video games, money for pizza…and then the power goes out. The pizza delivery man, Ulises, shows up, and they insist their pizza should be free because he didn’t deliver it on time, but he says the deal is off because the power is out and he couldn’t take the elevator. He won’t leave till they pay, and they won’t pay. Their neighbor, Rita asks to borrow their oven to bake a cake. And that’s pretty much it, that’s the story, the story of one beautifully ordinary but unforgettable day. People grow and change and learn about themselves, and forget and start over. Relationships shift, slowly and quietly, and then shift back again. It’s simple, it’s funny as hell, it’s sad but hopeful, and it’s one of the best new movies I’ve seen in years. This tart is a bit like a fancy pizza, and a very delicious one! It has a yeasted cormeal crust, which is very crispy and flavorful. 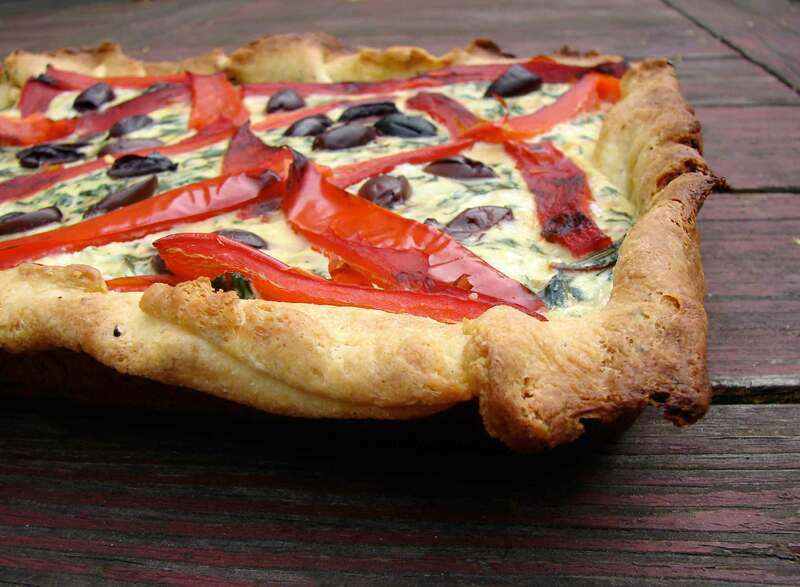 It has a ricotta custard, with mozzarella, and it has sauteed chard, garlic, shallots, and rosemary. Then it’s topped with roasted red peppers and black olives. Salty, sweet, comforting, cheesy, crispy, and flecked with greens. What could be better than that? Here are a couple of songs from the movie…Puto – Molotov. O Pato by Natalia Lafourcade. And Panorama by Alejandro Rosso. Combine the yeast, sugar and warm water and set aside for about 15 minutes to get bubbly. Stir in the olive oil, then add all of the dry ingredients. Add enough warm water to make a workable dough. You want it to be quite soft. Knead for about five minutes. Put a little olive oil in a large bowl, and roll the dough around in it so that it’s all coated. Cover with a damp cloth and set aside in a warm place for about two hours or longer. In a large bowl beat together the ricotta, eggs and mozzarella. In a large skillet over medium heat, warm the olive oil. Add the shallot, cook for about a minute, then add the garlic, rosemary and pepper flakes. Once the garlic has started to brown, in under a minute, add the chard and a few tablespoonfuls of water. Stir and cook for five to ten minutes until the chard is bright but tender and wilted. Set aside to cool for moment. Lightly oil a small baking dish, tart pan, or cake pan. Roll the dough to fit your dish. You want it to be quite thin – 1/8th inch, maybe. It’s okay if it’s not perfectly even, or if it sticks up around the pan. Place in the oven to pre-bake while you preheat it to 425. When it looks firm and less shiny, after five or ten minutes, take it out. Stir the chard mixture into the egg mixture, and pour all of this into the tart shell. Even the top, and make a pretty pattern with pepper strips and olives. Bake for about half an hour, until the custard is puffed and golden and the crust is browned and crispy. 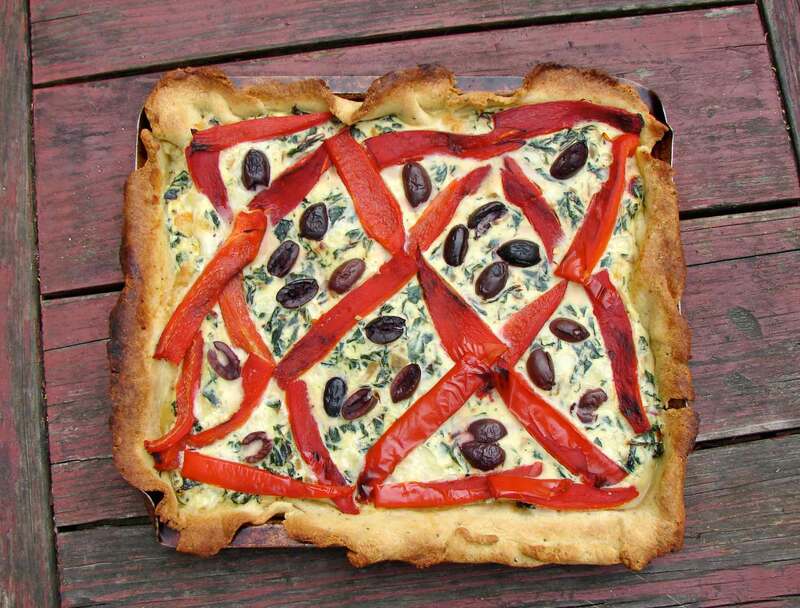 This entry was posted in basic pie filling, crust, recipe and tagged chard tart, duck season, Fernando Eimbcke, red pepper tart, ricotta pizza, savory cheesecake, temporada de patos by Claire. Bookmark the permalink.